RUGBY LEAGUE: The Hornets' home ground will be a hive of activity on Saturday as Cherbourg hosts the rugby league semi-finals. The action will kick-off at 9am when the under-12 team go head-to-head before the U14 and U16 teams do battle for their chance to play in the grand final on September 8. When the Mustangs and the Hornets A-grade sides take the field at 4pm, the teams won't just be playing for bragging rights, but to keep their season hopes alive. Mustangs will be down on strength without Elwyn Fewquandie, the top-scoring A-grade player in the South Burnett competition in 2018, who was suspended as a result of a dangerous tackle. But Mustangs coach Paul Brunjes is confident his team of 19 can step up and get over the line. "We are not going in at full strength but the boys will be ready and they are keen to play well,” Brunjes said. The Stags and the Red Ants will be fighting to be the first team to secure a spot in the 2018 grand final. 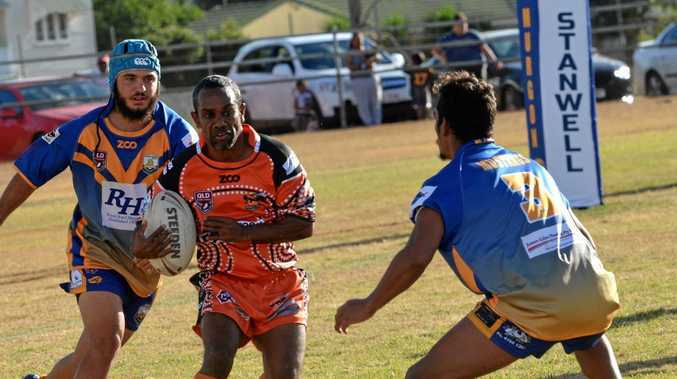 Red Ants got the better of the Stags the first time the teams met on April 21, winning in Kingaroy 22-20. When the Stags hosted the Red Ants on June 23 the home team took the win 54-12. With Saturday's game on mutual ground and a place in the grand final on the line, Stags coach Matthew Heit said it was anyone's game. "It puts more pressure on people when you get to finals and everyone reacts differently,” he said. Heit said being minor premiers came with the advantage of having a second chance, but the Stags would be playing as though their season dependedon it. "If we turn up and do the little things right we have as good a chance as any,” he said. Red Ants will have a few players returning from injury and coach Darren Geiger said the team were ready to take on the minor premiers. "The team is really excited that finals are finally here,” he said. "We will be fielding a really strong team.